Fast capture of cancer markers will aid in diagnosis and treatment | Fast capture of cancer markers will aid in diagnosis and treatment. A nanoscale product of human cells that was once considered junk is now known to play an important role in intercellular communication and in many disease processes, including cancer metastasis. 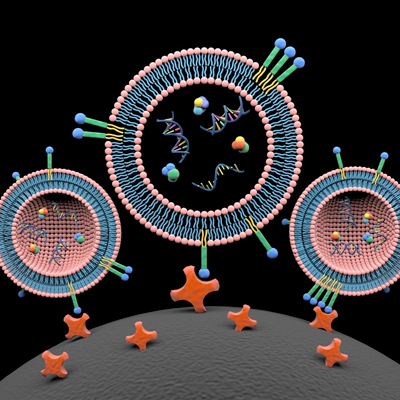 Researchers at Penn State have developed nanoprobes to rapidly isolate these rare markers, called extracellular vesicles (EVs), for potential development of precision cancer diagnoses and personalized anticancer treatments. "Most cells generate and secrete extracellular vesicles," says Siyang Zheng, associate professor of biomedical engineering and electrical engineering. "But they are difficult for us to study. They are sub-micrometer particles, so we really need an electron microscope to see them. There are many technical challenges in the isolation of nanoscale EVs that we are trying to overcome for point-of-care cancer diagnostics." At one time, researchers believed that EVs were little more than garbage bags that were tossed out by cells. More recently, they have come to understand that these tiny fat-enclosed sacks — lipids — contain double-stranded DNA, RNA and proteins that are responsible for communicating between cells and can carry markers for their origin cells, including tumor cells. In the case of cancer, at least one function for EVs is to prepare distant tissue for metastasis. The team's initial challenge was to develop a method to isolate and purify EVs in blood samples that contain multiple other components. The use of liquid biopsy, or blood testing, for cancer diagnosis is a recent development that offers benefits over traditional biopsy, which requires removing a tumor or sticking a needle into a tumor to extract cancer cells. For lung cancer or brain cancers, such invasive techniques are difficult, expensive and can be painful.